Radical prostatectomy or Watchful Waiting for early prostate cancer? Doctor Dilemma: Radical prostatectomy or watchful waiting for early localised prostate cancer? Radical prostatectomy, active surveillance, and watchful waiting are management approaches considered for early, localised prostate cancer. While three major trials support the utility of radical prostatectomy, how useful will this approach be for PSA-detected cancers? The necessity and timing of a radical prostatectomy in early localised prostate cancer is currently a matter of debate. Recent long-term data from a Scandinavian trial shows that patients with localised prostate cancer who underwent radical prostatectomy lived, on average, 2.9 years longer than those in the watchful waiting group. Prostate cancer is typically a slow growing tumour that shows few symptoms and has a low risk of metastatic spread and death from disease. However, in some types the cancer may be aggressive and spread rapidly. Observation through active surveillance is an option for patients with low-risk prostate cancer which is confined to the gland. Watchful waiting (WW), on the other hand, is a less intensive type of follow-up and relies more on changes in an individual’s symptoms; it focuses more on providing palliative treatment if there is evidence of disease progression. The lack of evidence regarding the effectiveness of treatment options seriously impacts the clinical decision. Both active surveillance and watchful waiting helps in preserving the individual’s quality of life, but they are also associated with the potential risk of delaying treatment and missing the window of curability. The use of radical prostatectomy is also a matter of debate. The following three pivotal clinical trials have tried to decipher the role of the above interventions in early localised prostate cancer. 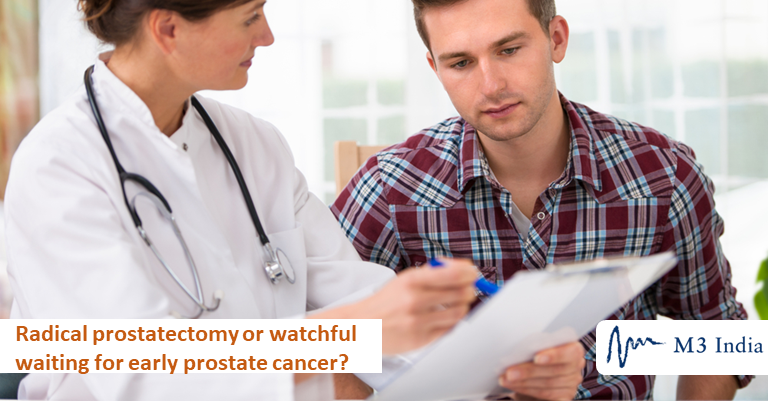 These studies compared the survival rates in early localised prostate cancer among patients who underwent prostatectomy/watchful waiting/active surveillance. The ProtecT trial also compared the outcomes with radiotherapy. The SPCG-4 trial compared radical prostatectomy and watchful waiting in patients with localised prostate cancer. The trial was initiated in 1989, before the era of prostate-specific antigen (PSA) screening and most enrolled patients had palpable tumours. 695 men with localised disease were randomly assigned to radical prostatectomy or watchful waiting between October 1989 and February 1999. Follow-up data were collected through 2017. By the end of December, 2017, in the intent-to-treat analysis, the cumulative incidence of death from prostate cancer was 19.6% with radical prostatectomy and 31.3% with watchful waiting. The mean years of life gained in the radical prostatectomy group at 23 years was 2.9 years. Another important point which the study concluded was that the benefit of radical prostatectomy was greater among men younger than 65 years of age at diagnosis than among those who were older. Even though the study lacked the use of PSA and the Gleason grading; it concluded that patients with intermediate-risk prostate cancer and less than 65 years of age fare significantly better with RP than with WW. The ProtecT trial compared the relative long-term impacts of radical prostatectomy, external-beam radiotherapy, and active surveillance on outcomes and quality of life (QOL) of patients with localised prostate cancer. At a median of 10 years, prostate-cancer-specific mortality was low irrespective of the treatment assigned, with no significant difference among treatments. Surgery and radiotherapy were associated with lower incidences of disease progression and metastases than was active monitoring. However, the authors reported certain differences in side effects and QOL between the arms. In the PIVOT trial (November 1994 through January 2002), 731 men with localised prostate cancer were randomly assigned to either radical prostatectomy or observation. After a median follow-up of 12.7 years, the study showed that radical prostatectomy and observation did not differ for all-cause mortality or prostate cancer mortality. It was also noted that surgery was associated with a lower frequency of treatment for disease progression, mostly for asymptomatic, local, or biochemical progression. Results from these important trials with prolonged follow-up provide a perspective on the utility of radical prostatectomy. However the trials are decades old, when most of the prostate cancers cases were clinically detected, and thus the outcomes might not translate to PSA-detected cancers. The treatments and diagnostic techniques for prostate cancer have also evolved since the protocols of the respective were developed. The results from the above studies seem to be contradictory; thus application in the clinic requires clinicians to individualize treatment. Patient’s personal preferences should be respected and the healthcare providers should explain the patients the potential benefits and risk associated with these treatment options. A shared approach to decision‐making between the patients and their healthcare providers is warranted.